The Share the Love event has started, so there’s plenty to be keeping you busy on the run up to Season 8 in Fortnite. Fortnite’s Share the Love event runs from February 8 until February 27, with new content arriving with tomorrow’s v7.40 update. Season 7 has lasted longer than previous seasons due to the winter break, so Season 8 will begin on February 28. There will be new challenges, a Competitive series and new Creative Islands being showcased every day. There will also be two double XP weekends on February 15-17 and 22-24 so you can level up your Battle Pass before Season 7 ends. 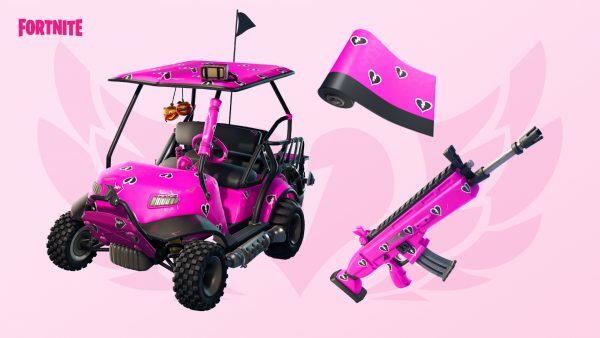 Players who either support a Creator or enter a Creator Code will receive the Cuddle Hearts Wrap. You’ll be able to claim your Wrap from now until February 22, though you won’t be able to access it until after the v7.40 update. For those of you who have completed all of the Weekly Challenges, there are Overtime Challenges coming this week. Complete these challenges to unlock rewards such as the Valentines Wrap and Vines Contrail. Battle Pass owners will also unlock new outfits for Trog, Powder and Onesie. Featured Island Frenzy will showcase the best of the Fortnite community creators, rotating through a list of publicly created islands. The event will start on February 12 and will run until February 22, so jump on to Creative each day to see something new. The main event is the Share the Love Competitive Series. The first placement matches for the Open Division ran over the weekend, with the top performers placed into higher divisions based on their performance. The next Competitive Division is the Prospect Division, followed by the Contender and Champion Divisions. More content will be available after tomorrow’s update. Players will unlock the next division by earning a pin during any daily session. If you managed to find a pin during the Champion Division, you’ll unlock access to the Champion Division Finals on February 23 and 24. You can earn special sprays from each division if you take part in the Competitive Series, too. The post Fortnite: Share the Love event adds Overtime Challenges, Featured Island Frenzy and Competitive Series appeared first on VG247.